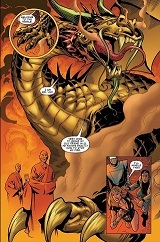 Powers/Abilities: Mister Lao was an extremely long-lived, if not immortal, lung dragon capable of breathing fire. He was gigantic in size and his hide was durable enough to withstand direct lightning and even bullets with no damage at all. After defeating a mystic genie, Mister Lao gained powerful mystic knowledge, enabling to cast spells such as restoration enchantments for the instant repair of items and even change his shape and size. Mister Lao also gained the knowledge of anyone he devoured but whether this was an inherent ability to his race of dragons or a mystic ability he gained from the genie's defeat remains to be seen. 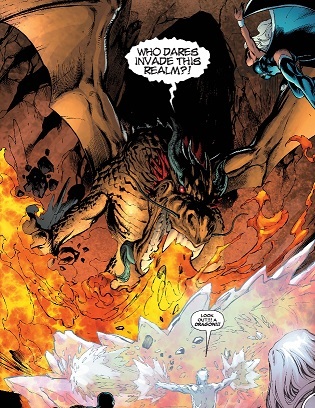 History: (Agents of Atlas II#6 (fb) - BTS) - Like most dragons, the lung dragon Mister Lao was thought to have evolved from dinosaurs, as his scales matched those of fossil DNA. 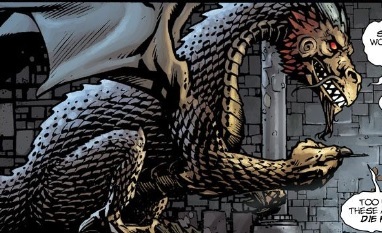 (Agents of Atlas II#4 (fb)) - Mr. Lao's molted scales were cut to focus light, allowing anyone holding the scales to view the energy discharge for portals leading the dimension known as the Dragon's Corridor. 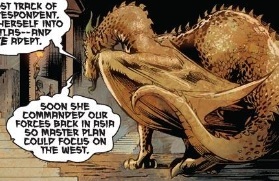 (Agents of Atlas II#10 (fb)) - Thousands of years ago, master strategist dragon Mister Lao was among the few and far apart dragons that worked side-by-side with humanity in large, territorial Dragon Clan Wars, in which armies used the dragons' molted scales to access the Dragon's Corridor dimension. 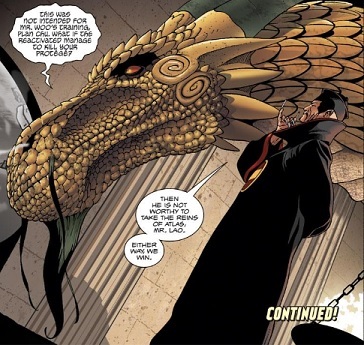 Eventually, Earth's sorcerer supreme sealed off the Dragon's Corridor, possibly saving both humanity and the dragons. Eventually over a period of centuries, the sorcerer's magic began to slowly fade. (Agents of Atlas I#6 (fb) - BTS) - Mister Lao, now adviser to the secret society known as the Atlas Foundation, ceremoniously devoured the previous leader each time the Atlas Foundation chose a new ruler, noting that each leader thought he would be the leader who would prove unable to find a successor. Over 700 years ago, Lao fought and defeated a powerful genie in the Atlas Mountains of Morocco, gaining powerful magics upon the genie's defeat but also gaining the genie's imprisonment. Imprisoned within the genie's lamp for 600 years, Mr. Lao was eventually freed by the Yellow Claw using the most powerful magician of the time during an Atlas Foundation rescue mission. Still imprisoned by servitude but at least free of the lamp, Mr. Lao became the Yellow Claw's royal adviser and helped the Claw in his attempts to restore Genghis Khan's empire to its former glory. When the Yellow Claw himself ascended to lead the Atlas Foundation, Mr. Lao remained by his side and later assisted in the Claw's manipulations of Jimmy Woo, whom the Claw had chosen as his successor. (Agents of Atlas I#6 (fb) - BTS) - In his role of assisting in the Yellow Claw's manipulations of Jimmy Woo, Lao disguised himself as a human. (Gorilla-Man I#3 (fb)) - In his human form, Mr. Lao had an agent meet with desperate soldier of fortune Ken Hale when he was drunk at a bar and tell Hale that Lao was looking for him. When Hale subsequently visited Mr. Lao, Lao remarked that he had heard Hale was endlessly resourceful and a real hand under fire, qualities the organization Lao advised considered invaluable. Lao then mentioned that the qualities were especially valuable when combined with immortality, peaking the sick Hale's interest. Lao continued, mentioning a magical African beast that had not aged or been sick in centuries and how killing the beast would transfer its immortality magic over to whomever killed it. Lao then provided Hale with maps to where the beast could be found. (Men's Adventures I#26 (fb) - BTS/Agents of Atlas I#6 (fb) - BTS) - Mr. Lao's story about the African beast caused Ken Hale to suffer from nightmares about killing such a beast, which Hale imagined as a Gorilla-Man. Becoming more frantic after days of nightmares, Hale asked around to corroborate Lao's story before ultimately traveling to Africa in search of the immortal beast, unaware that while killing the beast would grant him immortality, it would also take away Hale's humanity when Hale was transformed into the new Gorilla-Man upon the previous one's death. (Menace I#11 (fb) - BTS/Agents of Atlas I#6 (fb) - BTS) - Shortly thereafter, Mr. Lao commissioned the construction of the robot M-11 and when the scientist constructing M-11, Dr. Cyrus Virro, ran behind schedule, the Atlas Foundation sent an agent to assure the robot's completion by the following morning, reminding the doctor that the commissioned M series of robots were supposed to be war machines. (Atlas I#3/2) - Mr. Lao was present by the Yellow Claw's side when the Yellow Claw overrid the awakened M-11's programming in an attempt to force M-11 to create destruction and mayhem on behalf of the Atlas Foundation. (Agents of Atlas I#4 (fb) - BTS) - Considered a "higher-up" within the Atlas Foundation, Mr. Lao, often determining water elements in his designs, chose the Atlantean Namora to be a part of FBI agent Jimmy Woo's assembled squad of G-Men. (Agents of Atlas II#9 (fb) - BTS) - Lao befriended the sea serpent known as Yao. (Atlas I#1/2) - In 1958, when Woo's Department Zero/G-Men uncovered the Yellow Claw's corpse animation project in Maine, the Claw asked Mr. Lao what he should do, to which Mr. Lao replied that since the G-Men would uncover the entire project anyway, the Claw might as well do a test run of the animated corpses. Upon seeing the corpses go after Jimmy Woo, Mr. Lao commented that the battle was not intended for Woo's "training" and asked what would happen if Woo was killed by the corpses. The Claw replied that if Woo died then he was not worthy of taking the reigns of the Atlas Foundation. (Atlas I#2/2) - Mr. Lao and the Yellow Claw watched as Jimmy Woo's G-Men battled the Atlas Foundation's "Electroghouls," with Lao remarking that while he wanted the Electroghouls to prove effective, he would also like to see Woo and his team's effectiveness as well. Continuing to watch the battle from afar, Lao mentioned that if Namora had not declined Woo's offer to join his team, the situation against the Electroghouls would be perfect for her, to which the Yellow Claw replied that Namora's replacement, the Human Robot, would be more than adequate. Mr. Lao agreed, remarking on how puzzled he was that M-11, the Human Robot, was the only robot of Atlas' Menacer series that seemed to be able to think for itself. After Woo and his men forced the Atlas Foundation agent Emil to reveal the transmitter animating the Electroghouls, causing an Atlas explosive to go off in Emil's sinuses, Mr. Lao commented that the Gorilla Man had figured out the explosive inside Emil and that he didn't miss much. The Yellow Claw responded by agreeing that all of Woo's teammates meshed well together and he commented on how he envied Mr. Lao for being the only constant with the Atlas Foundation and how Lao would someday see the heights in which the Atlas Foundation would rise. When the Claw predicted that Jimmy Woo's Atlas Foundation dynasty would conquer the known world, Mr. Lao replied that the charts showed that as a favorable outcome and confirmed that someday, Woo's team would become Agents of Atlas. Lao then continued, mentioning that for now, the Yellow Claw reigned supreme. (Agents of Atlas I#6 (fb) - BTS) - When Woo's teammate, the Human Robot, was acquired by the Atlas Foundation following Marvel Boy's return to space, Mr. Lao cast an enhantment over the Robot that would allow it restore itself using available materials if damaged. When the Atlas Foundation lost track of Jimmy Woo, the Yellow Claw deduced that Woo had joined S.H.I.E.L.D. but Mr. Lao thought Woo dead. Mr. Lao then suggested the Yellow Claw focus the Atlas Foundation's influence in commerce. Still thinking that Woo would someday succeed him, the Yellow Claw wrote a letter to Woo, to be opened upon his death, in which the Claw explained some of his manipulations in Woo's life and suggested Mr. Lao fill Woo in on the status of his great-great-grandniece Suwan. In the memo, the Yellow Claw also warned Woo against trusting Mr. Lao despite claiming to love the dragon as much as any person and admitting that Lao's return to Atlas' service had been the greatest boon towards putting the Atlas Foundation back on track. Further explaining, the Claw warned that like any dragon, Mr. Lao had his own agenda and that Woo must always make sure Lao knew that Woo was master of the Atlas empire and that Lao must answer to Woo. Suggesting Woo recruit Venus, the Claw further admitted that Woo's ability to resist Venus' songs would aid him well in resisting the persuasions of Mr. Lao. (Agents of Atlas I#3 (fb) - BTS) - At some point, Jimmy Woo, who had indeed joined S.H.I.E.L.D., made notes about the Atlas Foundation and among the notes were papers mentioned the name "Mr. Lao." 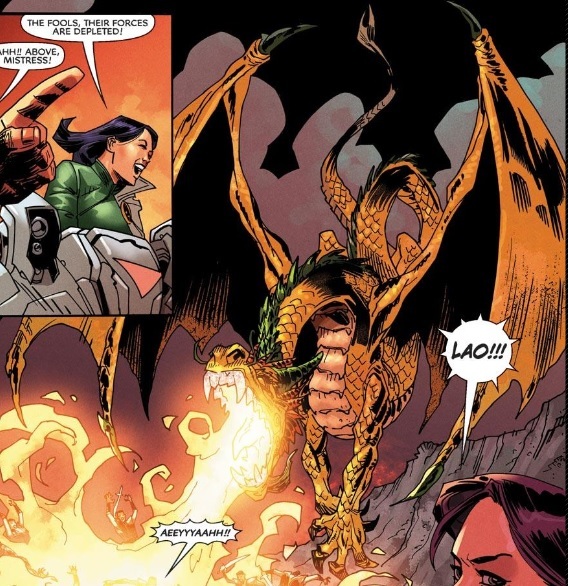 (Agents of Atlas I#6 (fb) - BTS) - Next to Mr. Lao's name in his notes, Woo wrote the characters for "dragon." (Agents of Atlas I#1 (fb) - BTS) - When aged S.H.I.E.L.D. agent Jimmy Woo led a group of disenfranchised S.H.I.E.L.D. agents in an attempted raid of the Atlas Foundation headquarters, they opened a secret passage that led to the dragon Mister Lao, who killed all of the agents except Woo. (Agents of Atlas I#1 - BTS) - Mister Lao wrote a memo cataloguing Jimmy Woo's restoration to his 1950s prime and in the memo, Mr. Lao remarked on manipulation and its similarity to the game of Chess as well as the impending destiny of Woo and his former teammates. (Agents of Atlas I#3 - BTS) - A rejuvanted Jimmy Woo went through his notes about the Atlas Foundation, he found papers mentioning Mr. Lao, a master plan and the Golden Horde. (Agents of Atlas I#4 - BTS) - Jimmy Woo reviewed his notes about the Atlas Foundation with the revived Namora, remarking that his notes mentioned a "bigwig" named Mr. Lao. (Agents of Atlas I#6 (fb) - BTS) - Noticing the characters for "dragon" next to Mr. Lao's name in his elderly self's notes, the youthful Jimmy Woo, whose mind had been reverted to his 1959 memories, thought that his elderly self notes were referring to an astrological "dragon" sign and not an actual dragon. (Agents of Atlas I#5 - BTS) - When Jimmy Woo deduced that the Yellow Claw was tracking him using the Human Robot and had the Human Robot sever his connection to the Claw, Mr. Lao confirmed the severance and announced that the Yellow Claw was no longer the Human Robot's master. A smiling Yellow Claw replied by telling Mr. Lao that he never truly was. (Agents of Atlas I#6) - After Jimmy Woo and his allies found their way back into the underground temple where the elderly Woo's S.H.I.E.L.D. squad had originally been killed by Mr. Lao, Mr. Lao again appeared and engulfed the entire area in fire. Fortunately for Woo and his friends, the Human Robot erected an energy shield around them all, saving them from Mr. Lao's fire and Mr. Lao introduced himself and welcomed them all to the temple, commenting on how wise it was to bring the Human Robot, as it knew exactly how to counteract his flames. Proclaiming that Woo and his group had passed the Atlas Foundation's gauntlet, Mr. Lao informed them that there would be no more defenses to stop them. Explaining that he was the royal adviser to the Atlas Foundation, Mr. Lao provided a history of the Atlas Foundation to Woo and his compatriots, revealing that Woo was the Yellow Claw's chosen successor to the Atlas Foundation before leading Woo to the Claw himself. After Woo spoke with the Claw, Mr. Lao watched as Jimmy Woo decided to take over the Atlas Foundation as the Yellow Claw's successor and when Woo grasped the Spirit Banner of Temujin, proving himself a Khan, Mr. Lao announced to the entire Atlas Foundation its new leader and CEO. With Woo as the new leader, Mr. Lao, as it had always been done, devoured the Yellow Claw, remarking that he still thought Kublai tasted best. Mr. Lao then took his place at Jimmy Woo's side as Woo began renovating the Atlas Foundation headquarters. Woo also found a letter to him written by the Yellow Claw warning against trusting Mr. Lao. (Spider-Man Family II#4 - BTS) - An image of Mr. Lao was used in play Animalia, put on by Atlas Playhouse in New York City. In the play, Mr. Lao's image was used when referring to the "old gods." (Agents of Atlas II#1) - When "Man-Mountain" Marko ventured off a tour of the Atlas Foundation's headquarters to confront "Jason," who was revealed as Atlas leader Jimmy Woo, Marko refused to give Woo informed on Norman Osborn and ran for it, only to be swallowed whole by Mr. Lao. Woo immediately ordered Namora to retrieve Marko from Lao's mouth but Lao had already swallowed Marko. Lao remarked that a superhuman tasted much better than the cattle Marvel Boy secretly brought him and Woo angrily reminded Lao that he couldn't just eat any prisoner the Atlas Foundation brought in and Gorilla Man remarked that Marvel Boy shouldn't have to be gathering cattle for Lao and ordered Foundation servant Chang to look into purchasing a cattle ranch. Mister Lao then revealed that Marko had no useful knowledge and admitted that Woo had missed a chance to bring a Venus-controlled Sentry into the Atlas Foundation, further expressing his fears that Woo's new order of the Atlas Foundation was not continuing the Khan dynasty. Brushing off Lao's remarks, Woo said he would take Lao's advice into consideration but Lao then replied that since Woo continually put himself in danger with the Agents of Atlas, Lao had activated a second Atlas Foundation leader in the east should Woo be killed in battle. Namora demanded to know on whose authority Lao activated the second group but Lao replied that the Atlas Foundation's bylaws were written on the east wall and stated that until Woo chose a successor himself, Lao had the decision in choosing one. Woo promised to take it up with Lao later. (Agents of Atlas II#2 - BTS) - When Mr. Lao noticed that Jimmy Woo again accompanied the Agents of Atlas on a field mission, he visually communicated with Woo aboard Marvel Boy's ship and reminded Woo that he needn't accompany his field agents. Woo argued that he wanted to be on-site to advise and Lao quickly reminded Woo that he could observe and advise from the Atlas Foundation's Hidden City as Lao was then doing. Woo replied that sometimes, he enjoyed getting the fresh air and reminded Lao who the Khan of the Atlas Foundation was. Lao admitted that no one was disputing Woo's rule of the Atlas Foundation but remarked that it was Woo's insistence on accompanying the Agents of Atlas that "forced" Lao to find a second leader, whom Lao revealed had arrived and was waiting to meet Woo. Woo sternly replied "good" before ending communication with Lao. Shortly after arranging a weapons deal with Norman Osborn's lackey, Grizzly, the Agents of Atlas were attacked by Lao's appointed successor, Temugin, who had teleported into the Agents of Atlas' ship and accused Woo of falling short as a leader. Upon hearing Temugin's remarks, Gorilla Man commented on how Temugin was telling the Agents' their business just because he had been appointed by Lao. 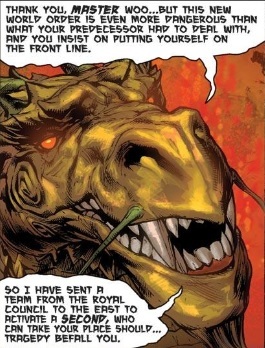 (Agents of Atlas II#6 - BTS) - When the Agents of Atlas were discussing evolved dinosaurs, Venus asked if Mr. Lao and all dragons were evolved from dinosaurs, to which Marvel Boy revealed that Mr. Lao's dragon scales matched DNA of fossils. Gorilla Man then chimed in, admitting that he would have no problem with Mr. Lao going extinct. Jimmy Woo then took that opportunity to tell the Agents of Atlas that, at some point before they headed back to headquarters, they needed to discuss Mr. Lao and his hidden agendas that stretched to before any of them were even born. (Agents of Atlas II#8 (fb) - BTS) - Mr. Lao became stingy with his molted dragon scales that allowed those who carried them to enter the otherdimensional Dragon's Corridor. (Agents of Atlas II#8 (fb)) - Mr. Lao informed Jimmy Woo that his former love interest Suwan had wished to become the next Atlas Foundation leader after the Yellow Claw lost track of Jimmy Woo and that she had thrown herself into Atlas Foundation work, handling Atlas' Asian forces while the Yellow Claw focused on the western forces. 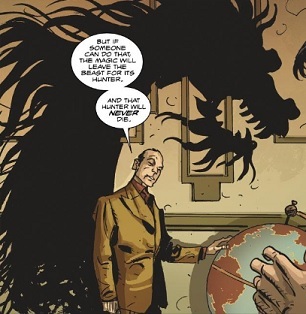 Further explaining that Suwan's desire to lead created a rift within between the Atlas Foundation's eastern and western forces, Mr. Lao had Atlas Foundation servant Chang gathered the ancient maps that might help Woo send a spy into Suwan's forces. (Agents of Atlas II#9) - After Jimmy Woo visited Suwan, only to learn she had become the Jade Claw, leader of the Great Wall organization, Woo contacted Mr. Lao from the downed spacecraft of Marvel Boy and demanded to know why Lao had not informed Woo that he would be breaking an ancient treaty by meeting with Suwan in person. Smiling, Mr. Lao feigned forgetfulness and asked if he had neglected to mention the treaty before his communication with Woo was interrupted by the Jade Claw, who had hijacked the signal. 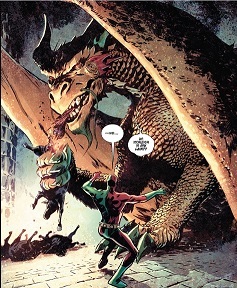 (Agents of Atlas II#10) - Upon returning to the Atlas Foundation's hidden city and preparing for a war with the Jade Claw's Great Wall society, Jimmy Woo confronted Mr. Lao, who focused on the Jade Claw and assured Woo that he had placed a sizable Atlas force at their entrance to the Dragon's Corridor. Woo instead asked if Lao had purposely led Woo to the Jade Claw in an attempt to have Woo killed so that Temugin could take over the Atlas Foundation. Feigned ignorance, Lao claimed to be wounded after he had spent so much time working toward Woo's destiny and claimed that he only wished not to deny Woo a chance to see Suwan again. Woo argued that he was stupid for ever listening to Lao and when Woo remarked that Suwan had likely been manipulated by her dragon, Lao immediately asked if Woo had seen the dragon or learned its name. Not quick to volunteer information to Lao, Woo asked what it was so important that another dragon was involved and Lao reluctantly asked Woo to follow him to his antechamber, where he revealed more of his history and suggested that the name of a particular dragon might be crucial to the Atlas Foundation overcoming the Great Wall, as only dragons could counteract other dragons. After hearing Lao's story, Woo reluctant informed Lao that the Jade Claw's dragon was named Yao. (Agents of Atlas II#11 (fb) - BTS) - Mr. Lao had the Atlas Foundation's warrior scholars perform the unbreaking spell on the Human Robot in preparation for its battle against the Jade Claw's M-21. 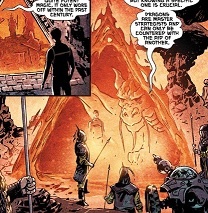 (Agents of Atlas II#11) - When the Atlas Foundation stormed the Jade Claw's Great Wall organization, Mister Lao accompanied them and breathed fire onto the Jade Claw's forces. The Jade Claw immediately sent her dragon, Yao, after Mr. Lao and Yao questioned whether Lao realized how few dragons were left on Earth. Recognizing Yao's logic, Mr. Lao stopped fighting and agreed to let their "pieces" in the Atlas and Great Wall organizations determine the winner of the Dragon Clan War. The two dragons then sat and watched as the Atlas Foundation won the battle against the Great Wall and absorbed the Great Wall forces back into their own. In the battle's aftermath, Yao commended Mr. Lao on having set his pieces up well and Lao replied that the wheel of history had spun back into their time and that the Great Game had once again begun. (X-Men vs. the Agents of Atlas#2) - After the X-Men invaded the Atlas Foundation's hidden city following the Agents of Atlas' theft of their computer Cerebra in an effort to find their missing teammate Venus, Mister Lao attacked the X-Men, demanding to know who invaded his realm. Woo quickly ordered Iceman to throw up an ice shield before Lao's fire burned the X-Men. Storm's lightning only managed to make Lao angrier and Iceman had difficulty keeping up the protective ice wall as Jimmy Woo and Cyclops seemingly passed out. When Iceman faltered and could no longer maintain the ice shield, Atlas' Human Robot projected a force field and Mr. Lao demanded that the Human Robot drop the shield. When Namor arrived and demanded a halt to hostilities, Mister Lao announced that all of the Atlas Foundation's golden horde would respect their Atlantean ally and hold their fire. (Avengers vs. Atlas#2/2 (fb) - BTS) - At some point, Mr. Lao further trained Jimmy Woo in martial arts, helping him add to his mastery of over fourteen martial arts. (Avengers vs. Atlas#2/2) - Mr. Lao gave Jimmy Woo a tip that the Atlas Hibachi restaurant was actually a splinter cell of the Atlas Foundation that was still loyal to the Yellow Claw and suggested Woo investigate and look for an ornate golden box. When Woo investigated, he began to think Lao's tip was wrong until the employees attacked him. Realizing Lao had been right, Woo searched for the golden box, ultimately battling a giant squid creature and causing an explosion that destroyed Atlas Hibachi. In the rubble, Woo noticed the golden box and acquired it, taking it back to Lao and remarking that the trouble better have been worth it. Opening the box, Lao announced that it was indeed worth it and began eating the dumplings inside. When Woo got angry that Lao had sent him for dumplings, Lao explained that they were not just any dumplings but rather, dumplings made from the rarest of sea creatures, and he admitted it was a shame that the dumplings could only be prepared by evil chefs. Lao then offered Woo one of the dumplings but Woo refused, claiming he had lost his appetite, to which Lao replied that it was too bad, as the dumplings were to die for. (Atlas I#2) - When the modern-day 3-D Man stumbled in the Atlas Foundation's hidden city while investigating Atlas, he felt he had run into a trap and ran away, accidentally running into Mr. Lao's domain. Surprised to see an intruder, Lao lunged to devour 3-D Man, who was saved when Namora grabbed Lao's jaws. While Lao claimed he would roast Namora as well, 3-D Man grabbed a spear but the Gorilla Man grabbed the spear, warning that it would only make Lao angrier. Breathing fire towards 3-D Man, Mr. Lao fought with Namora until Venus arrived and entranced Mr. Lao in her song. Recognizing the old song, Mr. Lao announced that he would do as she said and that his will was Venus' to command. Soon snapping out of his trance, Mr. Lao was confused by what he felt and angrily exclaimed that no one present would speak of the situation again before storming off. When the Agents of Atlas and 3-D Man soon left to handle an Atlas Foundation situation in Iceland, Mr. Lao mused that he had not seen the 3-D Man's chest symbol in many years and informed one of the Atlas Foundation servants to go to the Atlas Foundation scroll room and retrieve the scrolls related to glyphs. (Atlas I#4) - When beings possessed most of the Atlas Foundation soldiers in an attempt to get at the 3-D Man, Mr. Lao intervened in a massive battle between the Agents of Atlas and the possessed soldiers. Announcing that the Atlas Foundation soldiers were prepared to sacrifice their lives for the Atlas Foundation, Mr. Lao breathed fire on the soldiers and exclaimed that the soldiers would now have that honor of dying for the Atlas Foundation. Unable to combat Mr. Lao, the beings left the bodies of the Atlas Foundation soldiers and the Agents of Atlas attempted to get their injured to the hidden city's medical ward. Jimmy Woo then opened fire on Mr. Lao, angry that he had killed members of the Atlas Foundation, but Mr. Lao insisted that the beings were minutes away from total victory. Explaining that he was forced to kill the invaders, Mr. Lao revealed that the 3-D Man housed the power of three crystals, each from a different realm: Earth, an alternate Earth connected to the prime Earth and the Echo World, where the invaders originated. Having translated the Atlas Foundation's scrolls, Mr. Lao further revealed that the Echo Worlders had attempted to acquire all three crystals a few times throughout history with humanity always emerging victorious at a high cost of life. Before Lao could explain what the war between Earth and the Echo Worlders was about, the Uranian interrupted and revealed that the Atlas servant Chang had trapped one of the Echo Worlders within his own body. (Atlas I#5/2 - BTS) - After the Agents of Atlas ventured through the astral plane towards Echo World, Gorilla-Man asked if he was dead and whether he could haunt Mr. Lao or Wolverine. When 3-D Man re-established connection with the team, he laughed at the thought of a gorilla ghost haunting a dragon. (Atlas I#5/3) - Upon arriving on Echo World and witnessing the Echo Worlders attempts to stop the Agents of Atlas, the Uranian remarked that he could telepathically see the Echo Worlders' history and it was like Mr. Lao had said, their world mirrored that of Earth-616 and the reality connected to Earth-616. When Jimmy Woo encountered the ghostly Yellow Claw and thanked him for helping create the 3-D Man, who allowed Woo to end an eternal war, the Yellow Claw remarked that he had left explicit instructions with Mr. Lao that the Atlas Foundation be used to conquer the world. Once the Agents of Atlas had returned to the hidden city following their ending of the war with the otherdimensional planet Lurra, Atlas servant Chang wrote a memo documenting the success and when he asked about including Mr. Lao, Lao sarcastically replied that there was no need to mention him. (Gorilla-Man I#2 - BTS) - Mr. Lao continued his attempts to manipulate the Agents of Atlas by pitting them against one another, much to the annoyance of Gorilla-Man. Comments: Created by Jeff Parker, Leonard Kirk and Kris Justice. While Mr. Lao was not seen or even mentioned in Gorilla-Man's first appearance in Men's Adventures I#26 (March, 1954), it was later retconned that Ken Hale had spoken to Mr. Lao in a human disguise prior to going after the previous Gorilla-Man. Since Gorilla-Man's story in Men's Adventures I#26 begins with Ken Hale suffering from nightmares about the previous Gorilla-Man, one could assume that the nightmares came about after Ken had spoke with Mr. Lao about the African beast that granted immortality. Basically, Mr. Lao would have been behind-the-scenes in a flashback that occurs prior to the Men's Adventures I#26 story, as Mr. Lao's story about an African beast that granted immortality upon its death would have likely been what caused the nightmares Hale was having in Men's Adventures I#26. Similarly, it was also retconned that Mr. Lao had commissioned by Dr. Cyrus Virro to create M-11, the Human Robot, so Mr. Lao would also be behind-the-scenes in the Human Robot's first appearance in Menace I#11.